Boat 11 was placed in service on 12/16/12 (Trailer is still getting the tool boxes and equipment mounted). 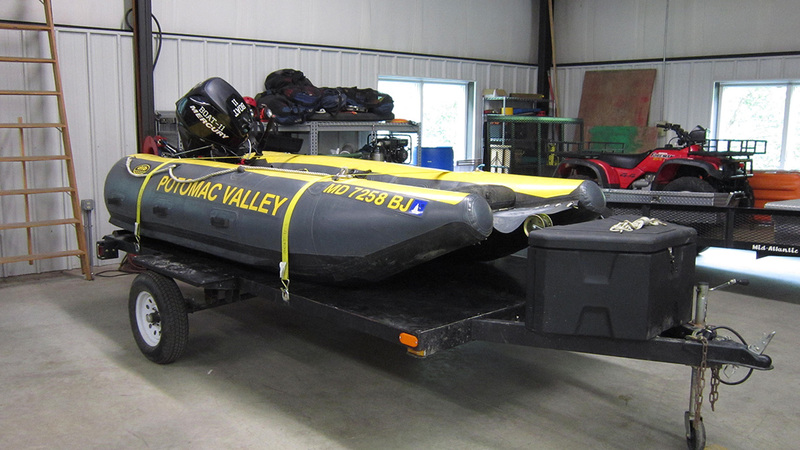 Boat 11 was bought used from Demaree Inflatable Boats in Friendsville, Maryland where it was used as a demo boat. Boat 11 is smaller and lighter then boat 11-1 which enables it to access the smaller and tighter area's of the Potomac and Shenandoah Rivers. The size and weight difference also allows this boat to be carried by hand to locations where there is no boat access, boat ramp or when the boat ramp is in excess able. Boat 11 can also be used for inland water rescues such as vehicles stranded in high water or other flood related incidents. Boat 11, just like boat 11-1 is primarily towed by Utility 11, Brush 11 and Engine 11-4 which carry all River/Water Rescue equipment. Both boats can also be towed by Support 11-0 and Support 11-7 if need be.